A lot of people have this game on this date circled on their calendars. Miami FC makes its debut in the NASL, while the Fort Lauderdale Strikers have been preparing since early January for the Spring Season kickoff. This marquee match is a South Florida Derby and Coastal Cup match rolled into one, which will also serve as the NASL's inaugural match on beIN SPORTS. Fort Lauderdale coach Ciao Zanardi signed several players with ethics based in jogo bonito including Kléberson, Maicon Santos, Adrianinho, and Matheus Carvalho to go along with last year's standout PC and the veteran Gabriel. Zanardi also made a couple of strategic signings of NASL veterans like Julius James, Nana Attakora, and Neil Hlavaty in the hope of getting past the semifinals of The Championship. Miami FC and its coach, Alessandro Nesta, could bring an Italian tactical approach to the NASL. The roster is a mix of players with NASL (captain Jonathan Borrajo, Mason Trafford, Jaime Chávez, and Pablo Campos) and international experience (Wilson Palacios, Dario Cvitanich, Rhett Bernstein, and Matuzalém). 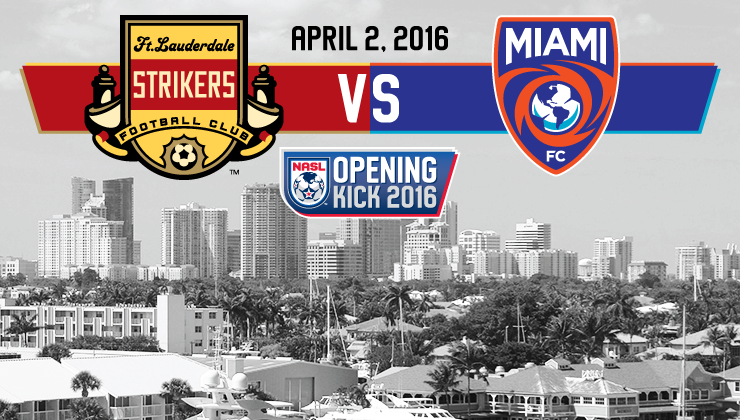 Miami FC’s debut match is without a doubt the start of something big.